If I could snap my fingers and be instantly transported to another country, I’d visit Japan. For as long as I can remember, I’ve been fascinated with this country and its incredibly rich culture. Be it art, architecture, food, landscapes and gardens… everything is aesthetically pleasing! From the outside, it is refinement at its finest. It is perfection and sophistication in every detail, and it is incredibly interesting to me. Not surprisingly, one of my favorite restaurants back home is a sushi joint called Blueberry. This Japanese restaurant was created after its two owners took a trip to the US. They fell in love with the Californian-style maki bars, and brought back both the concept and the chef himself to Paris. Speaking of the chef, Mr. Luu’s amazingly creative flavors can transport you anywhere at every bite. Plate after plate, it is a festival of colors, textures and tastes. While I always order a selection of rolls as my main, I never skip the “beef tataki” as a starter. Cut paper-thin and served raw at the center – with a slight outer sear – it is drizzled with soy sauce and seasoned with “Piment d’Espelette” (a French chili). 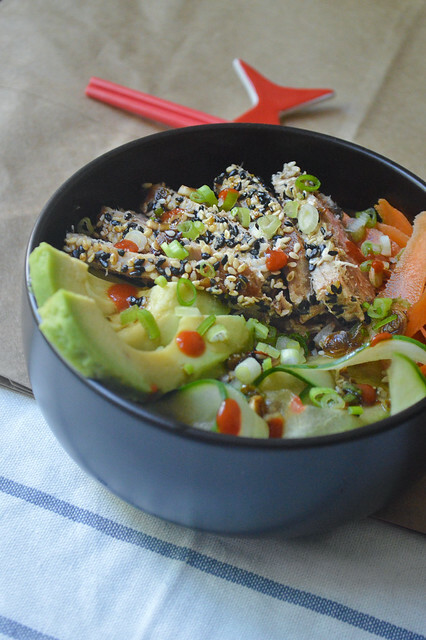 Now this dish is so good that it inspired me for this tuna bowl. In similar fashion, I wanted the fish to have an outer-crust and a tender center, with a spicy soy sauce. 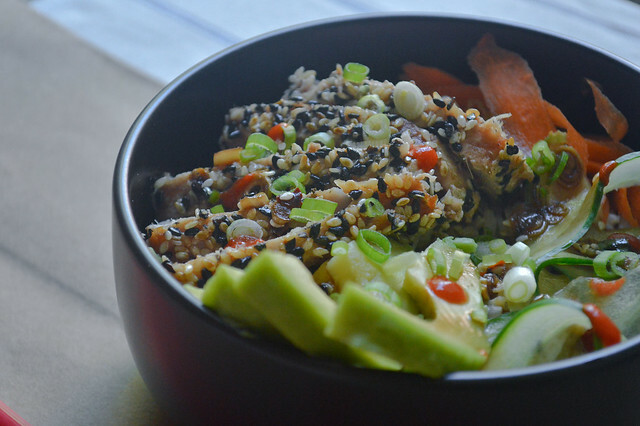 Sesame seeds and tuna were made to go together. I’m not sure who/why/how this combination came to be, but all I know it that it’s a match made in heaven. The slight crispiness of the golden seeds nicely complements the buttery raw center of the fish. 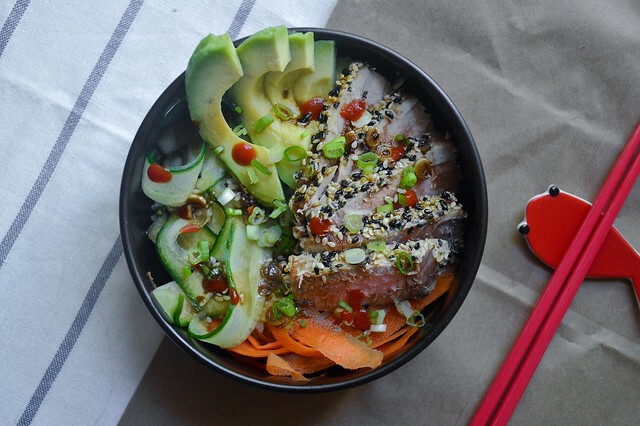 It’s classy with a slight kick, and it’s such a simple way to bring tuna to the next level. 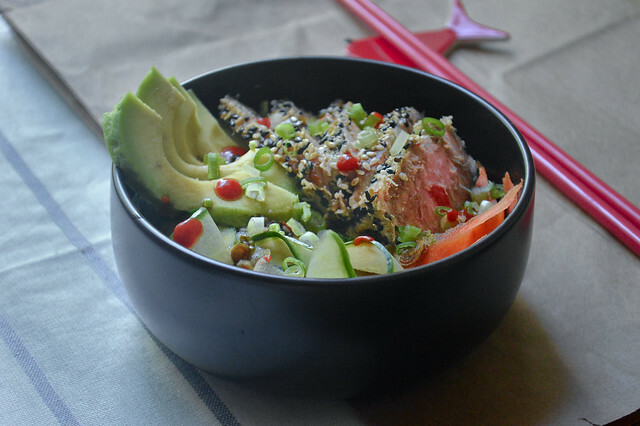 Since I didn’t want to roll the maki, I served it as a “sushi-bowl” instead where I added your typical avocado, carrots, and cucumbers. I then tossed everything in my “Blueberry-style” soy sauce and devoured the whole thing to the last grain. So until my Japanese dreams come true, this bowl might bring me closer at each bite. Bon appétit! Start by cooking the rice on medium heat. Cover the grains with 1/2 cup water, add a good pinch of sea salt, cover, and let it cook until all the water has been absorbed. Meanwhile, prepare the fish. Cover a plate with sesame seeds, pat the tuna steak dry, press each side flat on the seeds, and set aside. Peel the carrot and cucumber into ribbons using a vegetable peeler. Mince the scallion very thinly, and peel the avocado before slicing it lengthwise. Set aside. In a small bowl, mix the soy sauce, sesame oil, rice vinegar, Espelette pepper, and half of the minced scallion. Heat some olive oil in a pan and place the tuna steak face down. Let it sizzle for 1-2 minutes on each side, until the sesame seeds turn golden. Meanwhile, dress the bowl. Start with the rice and add the cucumbers, carrots, avocado slices, and half of the sauce. Slice the seared tuna thinly and place it on top. Garnish with the remaining minced scallion, a few drops of sriracha and the rest of the sauce. Enjoy! Commencez par le riz. Dans une casserole, recouvrez les grains avec 1/2 tasse d’eau, ajoutez une pincée de sel, couvrez et cuire à feu moyen le temps que l’eau soit absorbée. Pendant ce temps, préparez le poisson. Recouvrez une assiette de graines de sésame, séchez le steak de thon avec du papier absorbant et pressez chaque face sur les graines. Pelez la carotte et le concombre et faites-en des rubans avec un économe. Émincez l’oignon très finement, et pelez l’avocat avant de le trancher dans le sens de la longueur. Dans un petit bol, mélangez la sauce soja, l’huile de sésame, le vinaigre de riz, le piment d’Espelette, et la moitié de l’oignon vert. Mettez de côté. Faites chauffer de l’huile d’olive dans un poêle et laissez le steak de thon dorer pendant 1-2 minutes de chaque côté. Préparez enfin le bol de sushi. Commencez par le riz, les rubans de carotte et de concombre et les tranches d’avocat. Arrosez avec la moitié de la sauce, puis ajoutez les fines tranches de thon. Garnissez avec l’oignon vert restant, quelques gouttes de sriracha et la sauce. Bon appétit! 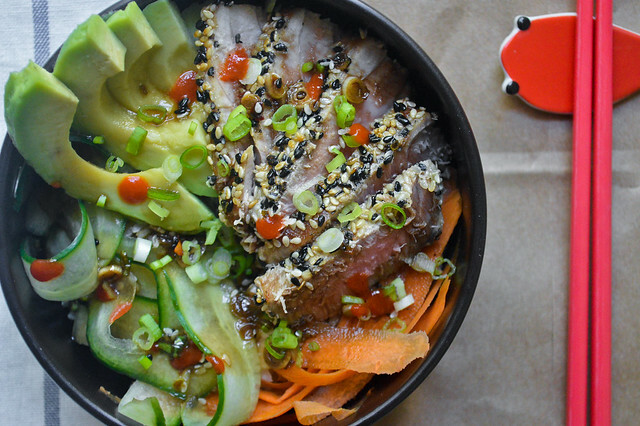 Posted on October 6, 2015 October 6, 2015 by julieadPosted in Dinner, Fish, Lunch, Main, Recipes, RiceTagged bowl, carrot, chili flakes, cucumber, fish, japanese, rare, scallion, sesame crust, sesame seeds, soy sauce, steak, sushi, sushi bowl, tuna. Looks so yummy. I feel like eating Japanese food for dinner! I’m almost always craving for Japanese food. Really look nice.. i think this delicious.. hmmm..
Pinned it! My mouth is watering!! looks amazing! I love Japan and Japanese food, although as a 15 year old on my first nigh visiting Japan when my host family took me to an Italian restaurant I was extremely relieved to not have to eat “scary” food. If only I’d known what I know now about their food and its amazingness! Nothing is better than food that looks beautiful but also tastes DELICIOUS. Which is exactly how I feel about this bowl. Going to grab ingredients to make it tomorrow for sure! mouth watering post..!! 😛 looks amazing..